Hear the untold stories of experienced pilots and aviation crew members on a 90-minute guided tour of the Pacific Aviation Museum on Ford Island, Hawaii. Step back in time with guides who shed light on key moments throughout 70 years of Pacific aviation history. Explore the Lt Ted Shealy Restoration Shop, occupying a former WWII hangar still riddled with bullets from the December 7, see footage of the 1941 Japanese attack on Pearl Harbor, and enjoy general admission to the rest of the museum. Enjoy a behind-the-scenes look at one of America’s most historic sites — Hawaii’s Pacific Aviation Museum Pearl Harbor — on a 90-minute Aviator’s Tour. Join veteran docents (resident experts) on a journey back in time and into Hangars 37 and 79, two still-intact WWII hangars that housed both the aircraft and the heroes of the War of the Pacific. Hangar 79 is the restoration hangar and a battlefield survivor that still bears the scars of the December 7 attack. Today it features a 1940s Carrier Aircraft Service Unit (CASU) rebuilt to wartime authenticity. Here, you can view various aircrafts being restored with WWII tools and see those awaiting restoration. 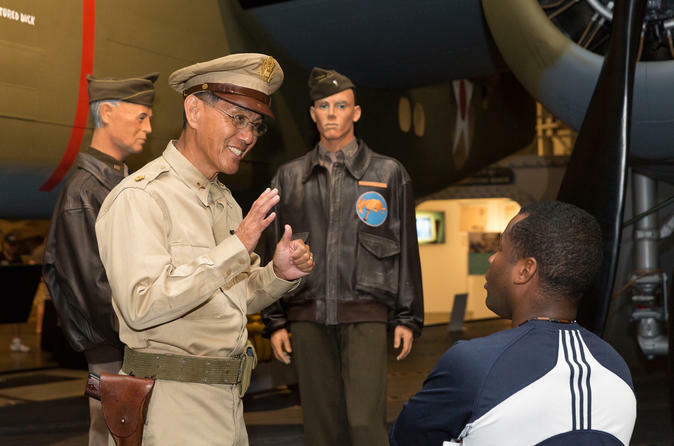 Your Aviator's Tour ticket also includes full general admission to the museum and its exhibits, including MiG Alley, the museum store, and the award winning Pearl Harbor documentary East Wind, Rain. Tours take place multiple times daily.